Paperback, 7.5 x 9.5 in. / 320 pgs / 122 color / 140 bw. Edited with text by Anders Kreuger. Text and interview by Irmeline Leeber. This is the first substantial English-language overview on the legendary ‘60s Fluxus artist and poet Robert Filliou (1926–87). With illustrations of nearly 192 works, it also features the transcript of an extensive conversation between Filliou and the Brussels-based art critic Irmeline Lebeer, recorded on seven cassette tapes in August 1976 in Flayosc in southern France. This conversation is structured as an abécédaire and touches on a variety of topics pertaining to Filliou’s art and thinking, from amitié (friendship) to zen. This conversation was intended to form the backbone of an extensive monograph but was never published—until now. 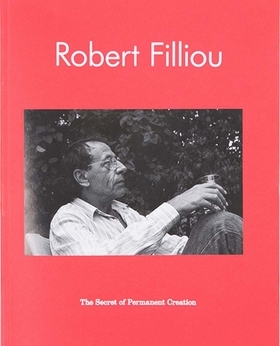 Robert Filliou: The Secret of Permanent Creation illuminates the mind and the practice of this massively underpublished artist, whose influence on subsequent generations has been both clandestine and colossal. FORMAT: Pbk, 7.5 x 9.5 in. / 320 pgs / 122 color / 140 b&w.